The Power of the Crowd — Explained! With the shift to Software-as-a-Service and Cloud nearly complete, organizations can optimize their end user experience and network operations with the power of crowd-sourcing. For decades, Internet-based sharing have improved the lives of billions. Now, companies can take advantage of this sharing when it comes to protecting and optimizing the very the thing that connects us, the Internet! Crowd-sourced network and application insights provide a remarkable way to understand how IT assets, the network, and SaaS services are performing in real-time. 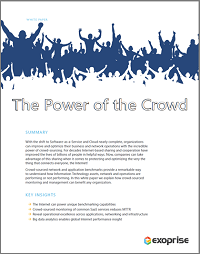 In this white paper we explain how crowd-sourced monitoring and management can benefit any organization.